Last time, we mentioned that January 1918 was the last publication of The Massachusetts Magazine. For possible contributing factors, we mentioned WWI as the United States was sending troops to Europe by the summer of 1918. Armistice followed that same year. Another factor was that some of the earlier contributors aged or passed away: Col. Thomas Higginson, F.B. Sanborn, and others. Dr. Frank had collected editors and contributors from the ranks of Civil War veterans and various New England Illuminati. Given the recent reminder, we must add the Spanish Flu. It was first observed in Kansas (Fort Riley) in March 1918. 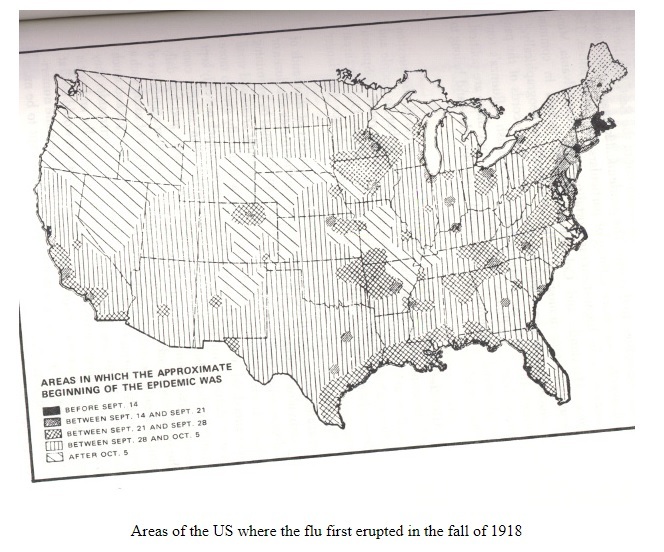 The map is from the Stanford University article on the pandemic (page has stale links, to be resolved). Not long after, the virus was seen at Camp Devens which is outside of Boston and was established in 1917. This was the pandemic where we see rows and rows of cots with sick soldiers. During this time, medical personnel would have been extremely busy. The base was named for Civil War general, Charles Bevens, who was involved in several battles in Virginia. 03/04/2018 -- NIH, in 2004, published an article by JM Barry (The site of origin of the 1918 influenza pandemic and its public health implications) who had researched and written about the flu pandemic in 1918. 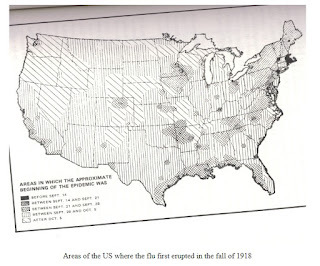 JM points to Dr. Loring Miner as having observed cases in Haskell County in January and February of 1918. By March, the flu heavily hit Fort Riley. Haskell County is southwest of Dodge City and is named for Dudley C. Haskell who had moved to Lawrence, KS with his family in 1855. Dudley was the namesake of Haskell Indian Nations University.